This past Tuesday (3/24) I went out fishing with a good buddy who I haven't gotten to spend much time with this winter. Normally we get out a lot for winter steelhead, but this season he had been a lot busier than normal when I had my days off. My friend was the lucky hot hand out there for fish eating his fly on this day out. Since my wife and I got a new DSLR camera, I have been stoked to take lots of pictures when I am out fishing. Nonetheless here is a photo essay of the day out there. Fish on! ...........Oh.....false alarm, but it is a fish; just not the targeted species. A cute little Cutthroat trout incidentally caught on a large steelhead tube fly. A couple of casts later and the intended target species is on! Brian tailed the fish on the first solid attempt. Nice work! 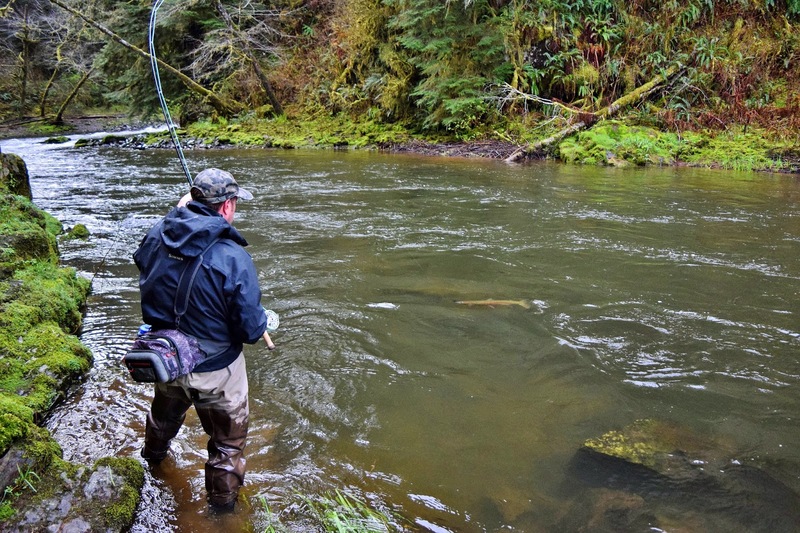 The mossy Pacific Northwest & two handed fly fishing for steelhead is a perfect marriage. Watch the "white mouse" run as you sweep your line. When it stops, your D-loop will be there ready for the delivery stroke. 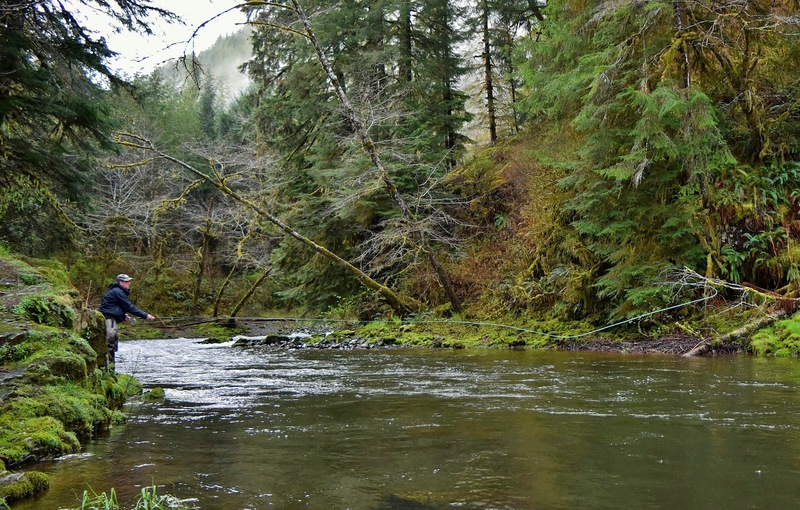 While I was fishing lower in this spot, Brian comes running downstream from the pool above with a fish on. Black and blue bunny tube catches another one for my friend Brian! 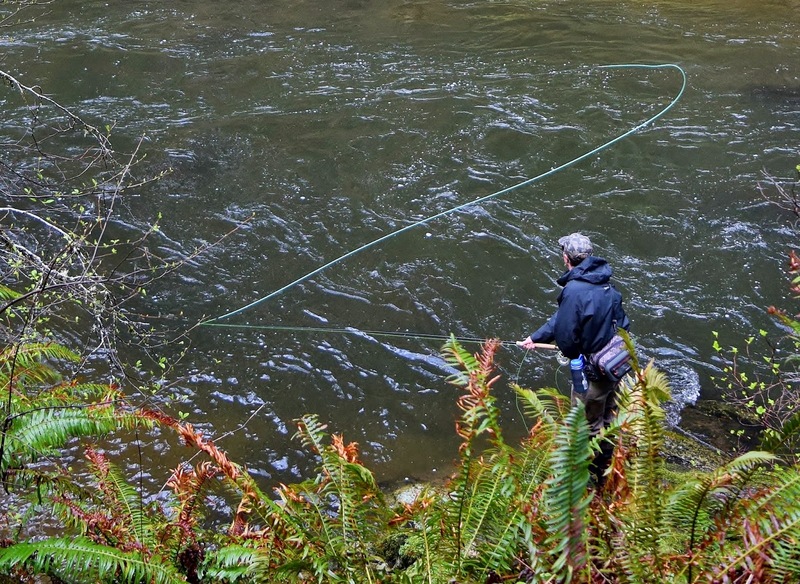 Swinging up nice native winter steelhead in late March always brings big grins to anglers.